Some professions are, well, more boring than others. But really that’s just a question of what we make of what we do! One particular worker, a delivery man, appears to have this all figured out. Delivering mail might not be the most exciting thing one can choose to do. Still, it pays the bills and one can work decent hours. And, who doesn’t love the mailman! Receiving things in the mail, especially these days with the digital world taking over, can be quite exciting. Here’s one delivery man however takes his job to a whole new level — he clearly understands the power of positivity! As he hops out of his vehicle and walks over to the house he is delivering a package to, he spots a hopscotch pattern on the driveway. 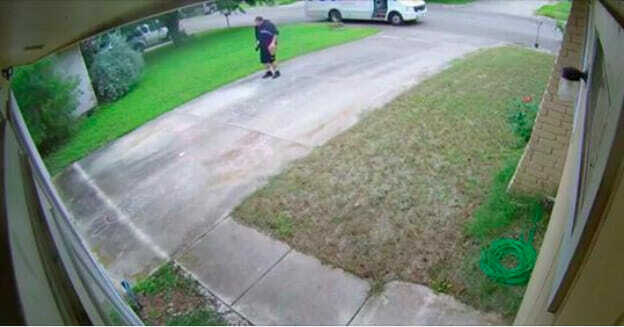 Sure enough, the jovial delivery man casually strolls over and does his own little hopscotch routine, ending with an enthusiastic ‘self-cheer’. The whole thing is simply too endearing! Once he’s done he walks over to the front door, where he realized the homeowner was watching all along. He proudly asks if she saw him complete the pattern to which she admits she did — and they both have a good laugh. Thankfully, the homeowner also managed to catch every thing on camera. She later posted the video posted online, and we’re so glad she did — this delivery man is a hit and has such contagious positive energy! Watch the whole thing unfold in the video below. Share if you had a good life and love this delivery man’s amazing energy and gusto for life as much as we did!